Thomas Banfield was one of the eight children of George and Ellen Banfield. He had been born in 1897 at Holbrooks in Weare Street where his father was a stockman. By 1914, the family had moved to Lime Tree Cottages on Ockley Green. 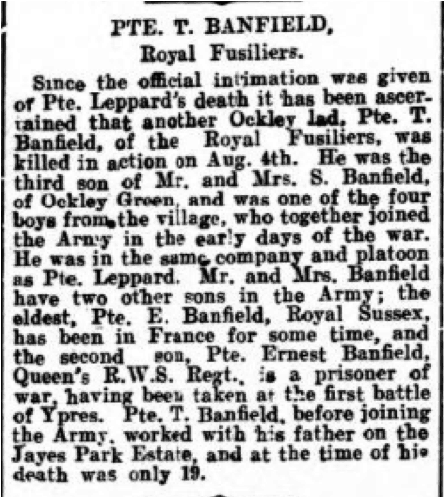 In January 1915, Thomas Banfield enlisted in the Royal Fusiliers at Horsham along other Ockley friends and was placed in the same platoon as Philip Leppard. They were sent to France in November 1915 and spent the winter in the trenches on the Western Front. In July 1916 their battalion was moved to the Somme sector and took part in the action on Delville Wood. 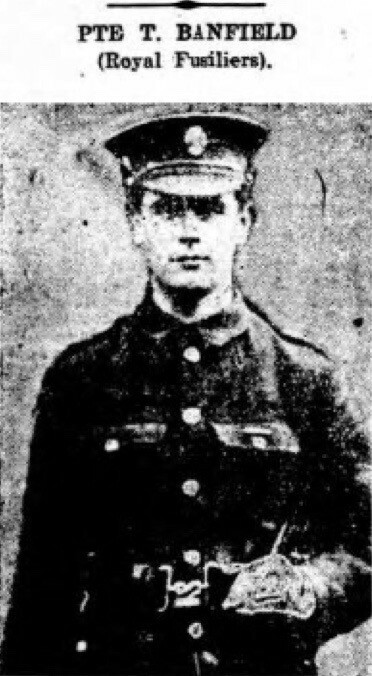 Thomas Banfield was killed on 4th August, the day the battalion was withdrawn from the area after suffering appalling casualties. His friend Philip Leppard had been killed the previous week.